Xpanda Trellis doors - a comprehensive range of quality anti-burglar trellis doors. All the doors come standard with a unique slamlock facility and offer so much more than traditional security gates. When you are considering the security of your home, the most important aspect should be to control who has access to your home and property. Whether we like to admit it or not, crime is one our largest concerns and we must take every precaution to ensure the safety and security of our homes and families. 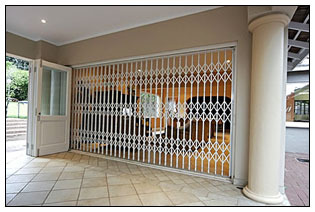 Traditional security gates and burglar bars do offer you protection to a certain extent, but will not offer you all the benefits and security of a quality trellis door. A trellis door retracts on itself and is thus ideal to fit in any space. You can also keep the trellis door locked and secure while your doors are wide open allowing light and air to flow through your home. The slam lock system ensures that the door locks quickly and easily behind you without the need of a key or other locking device. 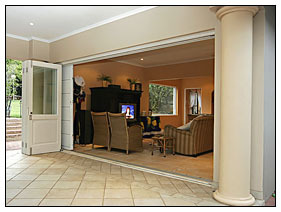 Large sliding doors that can easily be broken into can easily be protected and secured with a trellis gate, and similarly a small passage door that will help separate your bedrooms from your living area, trellis doors have a multitude of uses. High quality security trellis doors are able to withstand high pressure and with some models you would literally need a train to drive through them. Your trellis door can be used together with other security measures increase the level of protection in your house. You can attach an alarm system to the door so that you will always be aware if the door is open or shut. Whatever your home security requirements, a trellis door is a type of security gate that will help make your home a safer place to live. If you are security conscious and have your family's safety as a priority, contact us to find out more about security trellis doors.